But neither the UseAccount class nor the UseAccountFromOutside class can tinker with an account’s internalIdNumber field. What if you want a class like UseAccount to be able to get an existing account’s internalIdNumber but not to change an account’s internalIdNumber? (In many situations, getting information is necessary, but changing existing information is dangerous.) You can do all this with a getter method. 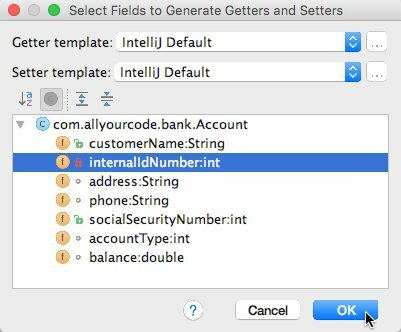 Getter and setter methods aren’t built-in features in Java — they’re simply ordinary Java methods. But this pattern (having a method whose purpose is to access an otherwise inaccessible field’s value) is used so often that programmers use the terms getter and setter to describe it. Getter and setter methods are accessor methods. Java programmers almost always follow the convention of starting an accessor method name with get or set and then capitalizing the name of the field being accessed. For example, the field internalIdNumber has accessors named getInternalIdNumber and setInternalIdNumber. The field renderingValue has accessors named getRenderingValue and setRenderingValue. Start with your code in the Android Studio editor. Click the mouse cursor anywhere inside the editor. On the Android Studio main menu, select Code → Generate → Getter and Setter. The Select Fields to Generate Getters and Setters dialog box appears. Alternatively, you can generate only getters by selecting Code → Generate → Getter. And you can generate only setters by selecting Code → Generate → Setter. A dialog box lists the fields in the class that appears in Android Studio’s editor. Select one or more fields in the dialog box’s list of fields. To create the code above, you select only the internalIdNumber field. Android Studio dismisses the dialog box and adds freshly brewed getter and setter methods to the editor’s code. Select Fields to Generate Getters and Setters.